Open Library's George Oates on the pursuit of concise categorization. At first blush, bibliographic data seems like it would be a fairly straightforward thing: author, title, publisher, publication date. But that’s really just the beginning of the sorts of data tracked in library catalogs. There’s also a variety of metadata standards and information classification systems that need to be addressed. George Oates, Open Library lead, recently gave a presentation in which she surveyed audience members, asking them to list the five fields they thought necessary to adequately describe a book. In other words, what constitutes a “minimum viable record“? 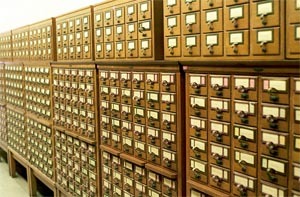 Akin to the idea of the “minimum viable product” for getting a web project coded and deployed quickly, the minimum viable record (MVR) could be a way to facilitate an easier exchange of information between library catalogs and information systems. In the interview below, Oates explains the issues and opportunities attached to categorization and MVRs. What are some of the challenges that libraries and archives face when compiling and comparing records? I was struck by an article I saw on a site called Apartment Therapy, about “10 Tiny Gardens,” where the author surveyed extremely different decorations and outputs within remarkable constraints. That same concept can be dropped into cataloging, where even in the old days, when librarians described books within the boundaries of a physical index card, great variation still occurred. Trying to describe a book on a 3×5 card is oddly reductionist. It’s precisely this practice that’s produced this “diabolical rationality” of library metadata that Karen Coyle describes . We’re not designed to be rational like this, all marching to the same descriptive drum, even though these mythical levels of control and uniformity are still claimed. It seems to be a human imperative to stretch ontological boundaries and strive for greater levels of detail. Some specific categorization challenges are found in the way people’s names are cataloged. There’s the very simple difference between “Lastname, Firstname” and “Firstname Lastname” or the myriad “disambiguators” that can help tell two authors with the same name apart — like a middle initial, a birthdate, title, common name, etc. There are also challenges attached to the normal evolution of language, and a particular classification’s ability to keep up. An example is the recent introduction of the word “cooking” as an official Library of Congress Subject Heading. “Cooking” supersedes “Cookery,” so now you have to make sure all the records you have in your catalog that previously referred to “Cookery” now know about this newfangled “Cooking” word. This process is something of a ouroboros, although it’s certainly made easier now that mass updates are possible with software. A useful contrast to all this is the way tagging on Flickr was never controlled (even though several Flickr members crusaded for various patterns). Now, even from this chaos, order emerges. On Flickr it’s now possible to find photos of red graffiti on walls in Brooklyn, all through tags. Using metadata “native” to a digital photograph, like the date it was taken, and various camera details, you can focus even deeper, to find photos taken with a Nikon in the winter of 2008. Even though that’s awesome, I’m sure it rankles professionals since Flickr also has a bunch of photos that have no tags at all. In a blog post, you wrote about “a metastasized level of complexity.” How does that connect to our need for minimum viable records? At Open Library, we’re trying to ingest catalogs from all over the place, but we’re constantly tripped up by fields we don’t recognize, or things in fields that probably shouldn’t be there. Trying to write an importing program that’s filled with special treatments and exceptions doesn’t seem practical since it would need constant tweaking to keep up with new styles or standards. The desire to simplify this sort of thing isn’t new. The Dublin Core (DC) initiative came out of a meeting hosted by OCLC in 1995. There are now 15 base DC fields that can describe pretty much anything, and DC is widely used as an approachable standard for all sorts of exchanges of data today. All in all, it’s really successful. Interestingly, after 16 years, DC now has an incorporated organization, loads of contributors, and documentation that seems much more complex than “just use these 15 fields for everything.” As every good archivist would tell you, it’s better to archive something than nothing, and to get as much information as you can from your source. The temptation for us is to keep trying to handle any kind of metadata at all times, which is super hard. How do you see computers and electronic formats helping with minimum viable records? George Oates: MVR might be an opportunity to create a simpler exchange of records. One computer says “Let me send you my MVR for an initial match.” If the receiving computer can interpret it, then the systems can talk and ask each other for more. Studies … looked at precision and recall, demonstrating that the two are inversely related — greater recall means poorer precision and greater precision means poorer recall — high recall being the ability to retrieve everything that relates to a search request from the database searched, while precision is retrieving only those relevant to a user. It’s a huge step to sacrifice detail (hence, precision) in favor of recall. But, perhaps that’s the step we need, as long as recall can elicit precision, if asked. Certainly in the case of computers, the less fiddly the special cases, the more straightforward it is to make a match.